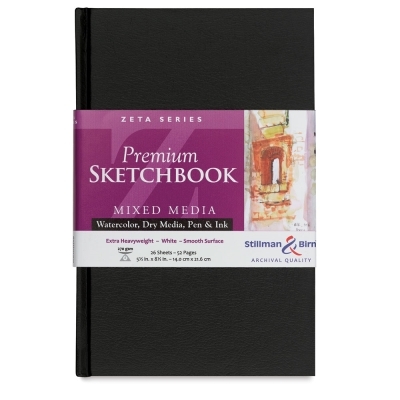 Stillman & Birn Zeta Series Archival Sketchbooks hold multiple sheets of heavyweight (180 lb, 270 gsm), natural white multimedia paper that is internally and surface sized to accept multiple wet media washes. Its smooth surface also assures exceptional line control for pen-and-ink and dry media. 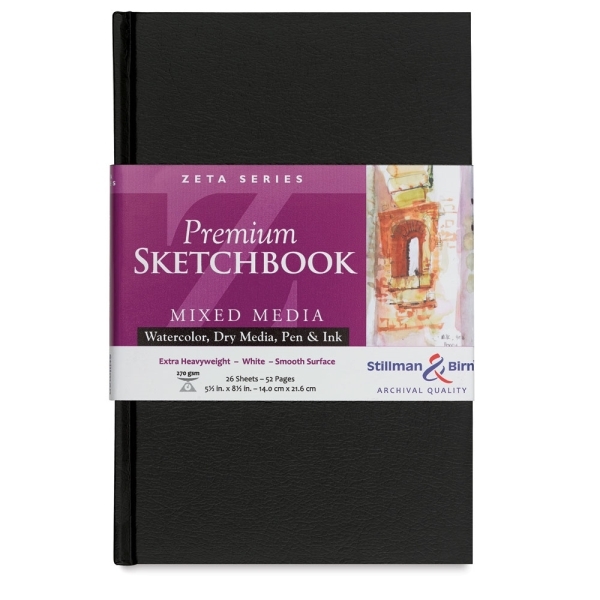 Available in both hardbound and wirebound formats, these sketchbooks contain multiple sheets of heavyweight (180 lb, 270 gsm), white multimedia paper. Internal and surface sizing enhance the paper's wet strength to accept multiple wet media washes, and its smooth surface assures exceptional line control for pen-and-ink and a full range of dry media. The hardbound sketchbooks contain 26 sheets (52 pages) of paper. The wirebound sketchbooks contain 25 sheets (50 pages) of paper.